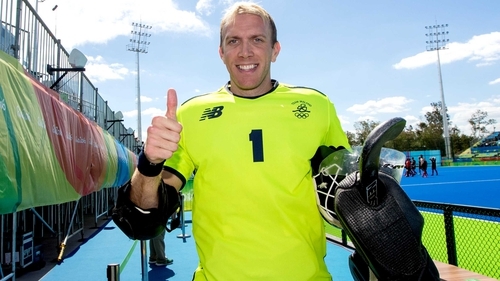 Ireland captain David Harte remains on course to lead his country at the upcoming Hockey World Cup, which starts in Bhubaneswar, India later this month. The Irish keeper picked up a leg injury at the weekend, where Ireland were competing in a four-team warm-up tournament, taking on the Netherlands, England and hosts Spain. Harte hurt his leg during the warm-up to the Netherlands match and was rested for the weekend games, where Ireland lost to the Dutch, and beat England on penalty strokes following a 2-2 draw. The Irish stopper wore a protective casing on his leg, which led to some inaccurate media reporting, claiming that Harte had fractured his fibula and was a major doubt over his participation at the World Cup. Hockey Ireland confirmed to RTE Sport this afternoon that Harte had been fitted with a medical boot but only as a precautionary measure. "David Harte was injured during a warm-up routine in Valencia," said a spokesperson. "As a precaution, he was fitted with a medical boot and underwent scans in both Spain and the Netherlands. We are optimistic David will be fit to compete in the World Cup." Ireland will be looking to emulate their female compatriots, who reached the recent World Cup final, as they open their campaign against Australia on 30 November, before completing their Pool B schedule with games against China and England.